RV Bays with Catwalks at Longley and Prater Way. Accepts Cash, Tokens , WashCards, Visa, Mastercard, Discover and American Express. 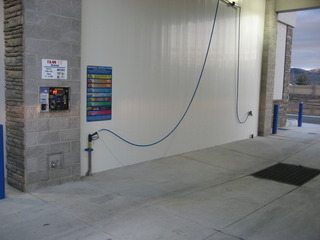 $4.00 EXPRESS WASH. Undercarriage wash, Presoak, Hi-pressure wash, Spot-free rinse, NO DRY. $5.00 DELUXE WASH. Undercarriage wash, Presoak, Hi-pressure wash, Clear coat protectant, Spot-free rinse, Vortex dry. $7.00 SUPER WASH. Undercarriage wash, 2 Step presoak, Hi-pressure wash, Tri-foam shine, Clear coat protectant, Spot-free rinse, Vortex Dry. $9.00 ULTIMATE WASH+HUB SCRUB. Undercarriage wash, 2 Step presoak, Hi-pressure wash, HUB SCRUB, Tri-foam shine, Clear coat protectant, Spot-free rinse, Vortex dry. Accept Cash, Tokens, Washcards, Visa, Mastercard, Discover and American Express. Touchless = Presoak Soap and High Pressure Wash for a touch free clean. Soft-Touch=Presoak Soap, High Pressure Wash and Soft-Touch Scrub with the Blue Brushes on the machine. Hub Scrub= A Scub Brush that scrubs the wheels for extra cleaning . We have Regular Vacs, Shampoo Vacs, Fragrance Vacs. New are our Turbo Vacs at our Prater Location. Double Vacuum time for Washcard users.$1.00 = 8 minutes.